There is much bandied about in the blogesphere about freebies. Some love them, others hate them, some get to many and others sulk for lack of any. For me a freebie are welcomed like any gift, as long as the giver understands that I will be honest in my review (if they expect one). 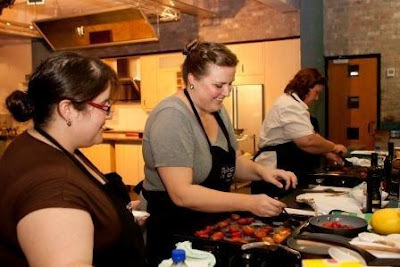 Canderel didn't expect one when they invited me to cook up a storm at The Cook's Playground. All they wanted was feedback. 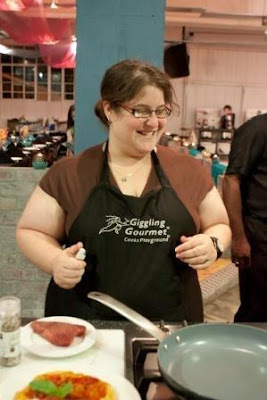 For me the best event invitation is one where I get to cook. Sure, sitting at a beautiful restaurant, enjoying magnificent food is great but it makes my night to be able to participate in the making of that food and to learn, teach and experience every step. Canderel teamed up with Jenny Morris to create 2 mouth watering, savoury dishes using the Canderel Yellow product, a sweetener designed specifically for cooking. 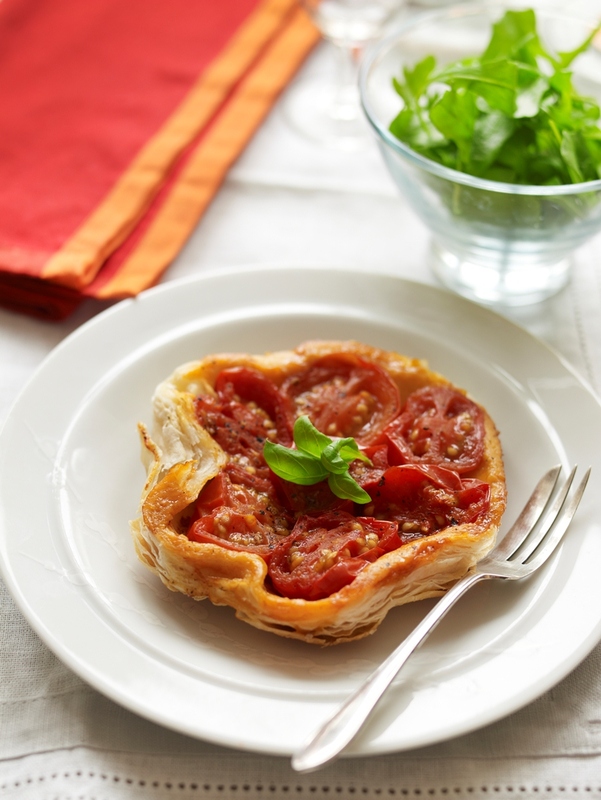 We baked gorgeous tomato Tart Tartins and succulent tuna steaks with tangy sweet and sour salsa. We finished off with a bright fruit soup, that Jenny made for us with seasonal fruit, young coconut and coconut water, flavoured with almond extract and Canderel Yellow. As soon as a nice warm, not so wet, day comes along I plan to attempt meringues with Canderel Yellow. If I succeed I know of a lot of very happy sugar free people. This makes a stunning starter or could be served as a main course with salad. For ease it can be made ahead if required. The tomatoes turn wonderfully sweet and caramelised once cooked. 2 Add the tomatoes to a roasting tin and sprinkle over 1tsp of Canderel Yellow and season with sea salt and freshly ground black pepper. Cook in the oven for about 15 minutes until they just start to soften and wilt a little. You want them to retain their shape. 3 Whilst the tomatoes are cooking, roll the pastry out on a lightly floured board to a 10cm round. Put to one side. 4 Now spoon the tomatoes out and sit them cut side down in a small pan along with the thyme if using, then add the remaining Canderel Yellow. Cook for a few minutes until some juices run then remove from the heat. 5 Sit the pastry over the tomatoes, tucking it in and around them. Put in the oven and cook for about 15-20 minutes until the pastry is golden. 6 Remove and leave for a few minutes then invert onto a plate, be careful as the pan handle will be very hot. Garnish with basil leaves. 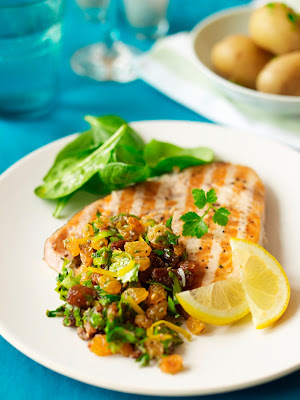 This meaty fish is griddled and served with a sweet and sour mix of herbs and sultanas. Protein rich swordfish is filling so a lightly dressed salad or spinach is all that is needed. 1 Lightly brush the swordfish steaks with olive oil and season with salt and freshly ground black pepper. 2 In a bowl add all the sauce ingredients, season with sea salt and freshly ground black pepper, taste and adjust as needed. Put to one side. 3 Heat a griddle pan until hot then add the swordfish steaks one at a time and cook for about 3-4 minutes each side, depending on their thickness, you want the inside to remain still pinkish. If you overcook they will become dry. 4 Serve the swordfish on a plate and spoon over the sweet and sour sauce and serve with baby spinach leaves or a salad. Note: Images and recipes were supplied by Canderel. I was not paid to do this post, only shown a really good time and a product that is easy to work with. Lovely evening...and a good product too!! Looks like so much fun! and yum!